← Bridgewater girls show the boys how it’s done! Bridgewater returned to South Manchester CC on Friday, for a return fixture against St. Bedes, Manchester. Put into bat for the first time in a game, Bridgewater had to deal with the pressure of setting a target for the opposition to chase down. The opening pair of Alfie and Daniel started well enough, with both playing scoring shots to get the team rolling. With every pair having to bowl a 9 ball over each, this side of the game was going to be crucial. To the credit of St. Bedes, they bowled extremely well and limited the number of wides and no balls bowled compared to the last game. Crucially, they also took wickets at regular intervals throughout the Bridgewater innings. Thomas and Matteo coped really well with the opposition attack and had scored well between them. 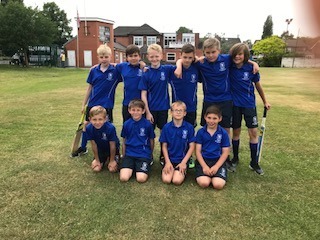 Unfortunately, a needless run out set the score back and with Lewis and Jake both losing wickets and struggling to score runs, the final few batsmen were under pressure to score and set a target to defend. Archie and Ethan both scored runs but also lost a wicket each to reduce the total innings score further. In the end, Bridgewater scored 63 runs to add to the starting total of 200, but the loss of 6 wickets meant the total to beat was 233. St. Bedes had a game plan when batting and looked to score quick singles whenever they could. This surprised Bridgewater and by the time they got to grips with this, the hosts had capitalised on some misfields and had scored well early on. Much to the bowlers’ credit, they kept going and with the more experienced bowlers to come at the end of the innings, the match result was still in doubt going into the final stages of the match. Mattel bowled beautifully again and took a well deserved wicket. Archie bowled amazingly well and was unlucky not to turn the game on its head with more than the one wicket he took. No runs were scored off his over and he could have had 3 or 4 wickets on another day in what was a tremendous spell of bowling. Going into the final over Bridgewater needed three wickets to win the game. Despite a good over from Harvey, St Bedes held out for a 17 run win and levelled the series at 1-1. A great contest all round and ideal preparation for Bridgewater’s attempt at winning the ISA Cricket Festival this Friday at Queen Ethelburgas in York.